Colortrac SmartLF SC 42c Xpress | Copymat spol. s.r.o. Colortrac SmartLF SC Xpress Series - A well-proven, innovative technology for great wide format image quality. SingleSensor is a Colortrac invention that combines CIS elements and LEDs in a single line for maximum scan accuracy and optimal illumination. Reliable and affordable scanning with a fast return on investment. Get the job done ‘super-fast’ with no stopping or waiting. The new design incorporates a larger face-upstaging platform to make loading documents into the scanner faster and easier. SC 42 Xpress is the first Colortrac scanner designed specifically to auto-size documents face-up in the centre of the scanner, a change which helps the operator to see what they are scanning and also to load creased documents more effectively. For documents conforming to standard drawing sheet sizes (manual mode) the scanner can accept media side & center using SmartWorks Pro or at the side only using the SmartWorks EZ Touch software. An included magnetic paper guide accessory can be used to maximise side margin accuracy where required. 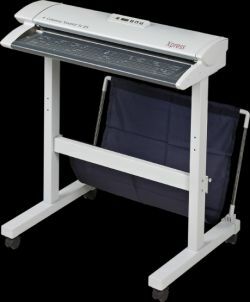 With a straight-through paper path the SC 42 Xpress has a maximum media width of 44” (1117mm) and scans documents and maps up to 0.08” (2 mm) in thickness. This is more than enough to meet the requirements of AEC, CAD, GIS and the majority of work done by copyshop or service bureaux.